A lot has been written about Vietnam. Just last week, I reviewed the companion book to Ken Burns’ documentary series on the war. The book did not shrink from holding a mirror to both sides, but it underscored how America saw the war as part of the Cold War while Vietnamese, eventually most Vietnamese, viewed it as a war of independence. Many soldiers were interviewed from both sides, and a good deal of one of the final chapters had been given over to Vietnamese-American writer and professor Viet Thanh Nguyen. 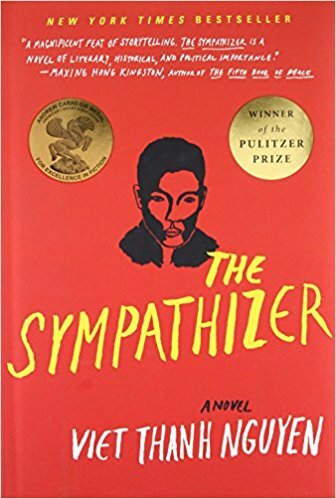 It prompted me to get the Audible version of his novel, The Sympathizer. In it, Nguyen tells the tale of an unnamed North Vietnamese mole in the South Vietnamese military. He is of mixed heritage, the result of an illicit union between his mother and the French Catholic priest in his village. He is a communist agent schooled in America and well-versed in the ways of the heavily armed visitors. The General, also unnamed, is a high-ranking official in the Saigon regime. He trusts the narrator completely as they arrange to escape ahead of Saigon’s imminent fall. What follows is a story that can only be told of a man of two races, two ideologies, and two cultures, a Vietnamese with white blood, a Catholic living in a mostly Buddhist country, a communist in exile with republicans from the south, a Vietnamese man living in an America that doesn’t know how to assimilate him. While living with his best friend Bon, who loses his family near the beginning of the book, he sends coded messages to “my aunt in France,” really his childhood friend Man, who is his controller from the Hanoi regime. What follows is a story of degradation, men once considered successful, powerful, and masculine reduced to the meager existence of unwanted immigrants in a country where their wives and girlfriends no longer respect them. The General, now a liquor store owner, dreams of leading an army to take back Saigon. ﻿ To defend himself, the narrator deflects suspicion of a mole to another nameless character he dubs the Crapulent Major. Ultimately, he is tasked with arranging the major’s execution, and, as if Nguyen paid close attention to Battlestar Galactica, the major begins appearing as a hallucinatory ghost to our protagonist. He is also tapped to consult on a movie that comes off as a thinly veiled version of Apocalypse Now, a bombastic film with an infante terrible director. The fictional film is more like a traditional war movie, but clearly, with references to the Philippines location and and the director (sarcastically referred to as “The Auteur”), it’s clear Nguyen has a healthy disdain for Apocalypse and Francis Ford Copolla. The novel is equal parts tragic, funny, and philosophical. You get the impression that those who forment revolution have as little regard for the individual as those they are revolting against. A line frequently repeated when the narrator ponders his communist mindset is that people “must be represented as they cannot represent themselves,” a phrase that sounds as dubious coming from Uncle Ho (Chi Minh) as it does from party hardliners in America today (on both sides). But the narrator is an individual deprived of his own freedom of choice by forces beyond his control. The novel is written as a confession to a prison commandant, indicating early on that he winds up back in his homeland, but not as a hero. The confession is actually for a Faceless Commissar, and his “reeducation” could be taken straight out of 1984 if Nguyen himself and Ken Burns hadn’t detailed such events already in the documentary series. Nguyen himself is the perfect author for this story. Raised in America, he has lived in the Vietnamese diaspora most of his life and is intimately familiar with almost every aspect of Vietnamese life before the country became communist in name only. Yet as an America, he spins the tale in English in a style that is both cinematic and poetic. I was disappointed when the narrator stopped his story where he did as I wanted more.